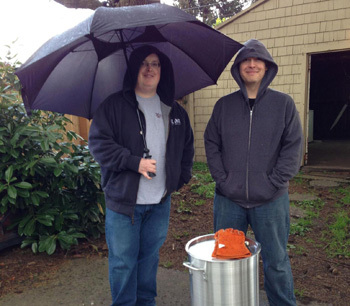 In late 2012, Jason asked Josh "Hey, did you want to start homebrewing?" Josh said yes, and the rest, as they say, is history. Originally called Carriage House Brewing because we were going to be brewing in the carriage house, but a new name would be needed after discovering a homebrew operation on the east coast that was already using that name. On January 27, 2013, Two Hinge Brewing was officially founded and joined Facebook, Twitter, and the web. Even though we started off brewing with extract, we would eventually convert to brewing all grain, and brew four different varieties of beer. 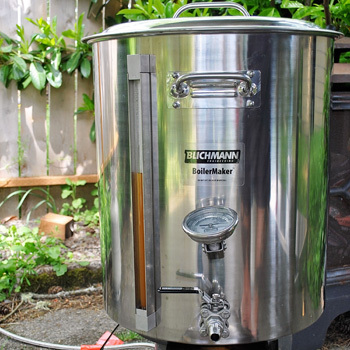 Two thousand and fourteen started off with the idea to start brewing bigger batches, and for that we would need different equipment. A plan was hatched to tap our growing fanbase to help with a fundraiser that would offset some of the costs of the new equipment that we would need. Our friends at SonarFeed even allowed us on their podcast to talk about our beers and fundraiser. Thanks to so many of our supporters we will now be brewing 10 gallon batches (1/3 of a barrel!) and hopefully be locking down the recipes for our four regular beers. We also have plans for more beer to rotate through our brewing sessions, so be sure to look for those this year.